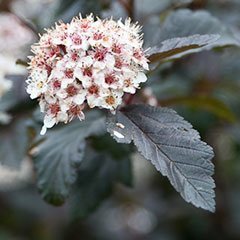 Ninebark is an old faithful shrub that has received a wardrobe makeover in recent years. It now lights up the landscape like a rock star in hues of gold, copper, red, wine, royal purple and burgundy to black. It’s definitely not your father’s Physocarpus! This shrub is the ideal candidate for amping up the color in locations that are perfect for a carefree, hardy, vigorous and fast-growing shrub. Hedges, privacy screens, shrub borders and mixed borders are some of the locations in which Ninebark (Physocarpus opulifolius) thrives, transforming a utilitarian planting from boring to stunning. This graceful, multi-stemmed shrub flourishes in sunny locations and requires little care. Other attributes include hardiness (USDA zones 3-7), adaptability to most soil conditions and drought resistance. This shrub is easy to grow and very vigorous – plants will reach mature size of 8-10 ft. tall and wide in four to five years. Individual shrubs can be kept more compact by cutting them to the ground in early spring. The leaves of ninebark are deciduous, and their color remains vivid all season in northern climates, but fades to green in hot southern summers. Two-inch wide clusters of pinkish or white flowers cover these shrubs in late spring, followed by reddish seed capsules that persist through the winter. The bark of young stems is reddish brown, but as stems age, the bark peels repeatedly in layers of papery strips to expose new bark underneath, lending winter interest. 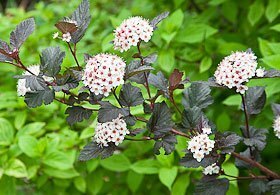 This is how it gets its common name of ninebark. 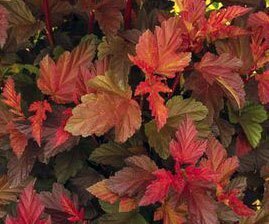 Physocarpus opulifolius Coppertina™ (‘Mindia’) – copper-orange spring foliage matures to bright red on 8-10 ft. plants. The red seed capsules are also showy. Diablo™ (‘Monlo’) – reddish purple foliage. 6-8 ft. tall. Summer Wine™ (‘Seward’) – fine textured dark wine colored foliage on 5-6 ft. tall plants. ‘Royalty’ – fine textured deep royal purple foliage on a 6-9 ft. tall plant. ‘Dart’s Gold’ – a dense 4 ft. tall shrub with golden leaves. Center Glow™ – foliage on this 8-10 ft. shrub opens gold before changing to burgundy.